Espresso is definitely not made in the same way you make a simple cup of coffee. For starters, you need to use coffee beans that are of premium quality. No generic bargain bin bags here, you need the good stuff. These high-quality beans also need to be processed into super-fine grounds. You also can’t brew espresso in your countertop coffeepot. Espresso needs to be made in a machine capable of the processes necessary for pulling a perfect shot of espresso. Italian espresso is the preferred type of espresso for aficionados as well as newcomers to the espresso world. When it comes to espresso, Italians are the ones who know how it is done and they do it right. It should come as no surprise then that Italian espresso machines are the best ones available on the market. If you want espresso done right and you want to do it at home, you need to purchase a machine that has roots in Italy. As with anything, people have their preferences as to which company is the best at creating a perfect shot of Italian espresso. There are certain companies that are top contenders on almost every list though, and here we’ll take a closer look at them. 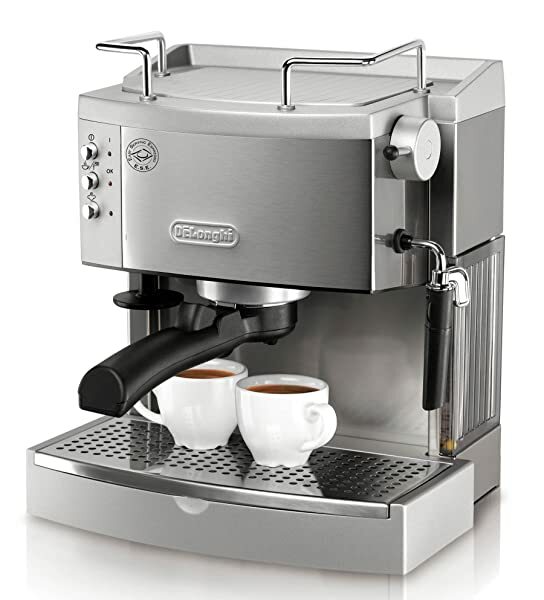 Our pick for the best Italian espresso machine is the DeLonghi EC680M DEDICA 15-Bar Pump Espresso Machine. This espresso machine is ready to brew in a matter of seconds and has your espresso in your hand within minutes. Both of these machines have a number of features you’ll love. We’ll review these along with a few others below. Originating from a spare parts workshop in Treviso, Italy, DeLonghi got its start in 1902 and has been producing quality appliances for over a century. In the 1950s, DeLonghi grew too large to remain within the shop and became a full-fledged company. They strove for excellence in their innovative designs and brought forth outstanding home appliances. They succeeded, and their name became synonymous with quality. Over the decades, DeLonghi continued to grow and change and throughout the 1970s and 1980s they brought new appliances to the market. Air conditioners and oil-saving deep fryers were added to the list of appliances made by DeLonghi and they expanded into much larger markets. In 2001 they introduced their most well-known product: the fully automatic espresso machine. This machine was a hit in the appliance world and brought DeLonghi into the fold with other high-end options. 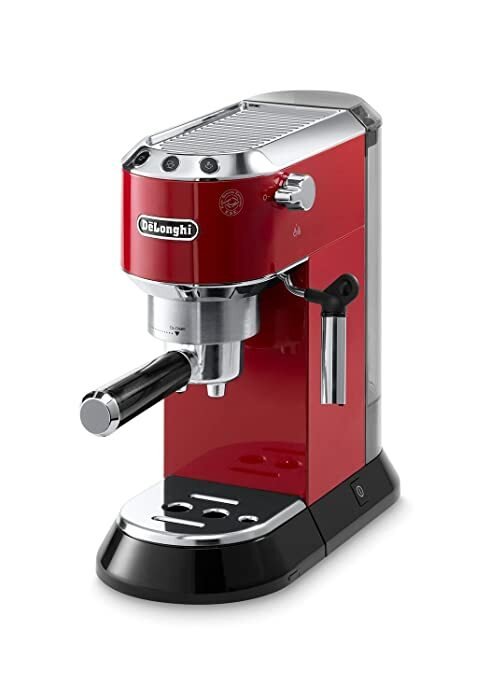 The espresso machines from DeLonghi span a wide range for every person’s wants. There are both automatic and manual pump espresso machines. Though all of the automatic machines are silver, you can find machines in nearly any color including red, black, khaki and bronze. 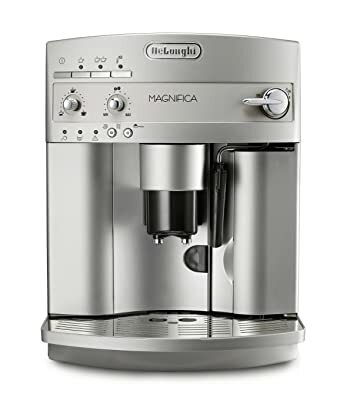 DeLonghi also manufactures quality milk frothing jugs and coffee pots, and they make some of the machines in the Nespresso range. In Milan, Italy in the 1930s there was a man who was bound and determined to create the perfect espresso. Achille Gaggia was busy working in his family’s coffee bar named “Caffe Achille” when he began to notice that the customers wanted better espresso. He decided he was going to do whatever it took to brew the perfect pleasing shot of espresso and began tinkering in the warehouse of the coffee bar. He worked day in and day out in his quest to perfect extraction processes and find the holy grail of espresso. He soon met another man on the same journey and they began to work together to perfect the method of coffee extraction. They found a method that didn’t rely on the use of steam, but instead used pressure from hot water. Achille Gaggia dubbed it the “Lampo”. The Lampo was patented in the fall of 1938, and the business of making espresso was revolutionized. Unfortunately, baristas wanted something that was a machine all in one, so Gaggia had to go back to the drawing board. He continued to work on different mechanisms, applying for patents as soon as he had worked out all the kinks. In 1947 he successfully created and patented a brewing mechanism that used a lever piston to push the hot water through the coffee grounds at high pressure, extracting all the flavor and aroma. With all of these pieces in hand, he then unveiled his “Tipo Classica” in 1948. It was the first espresso machine of its kinds, and it changed the way coffee bars did business. Customers started demanding a way to recreate their delicious espresso at home without sacrificing quality or flavor, and as he had always done, Achilla Gaggia took this task on at once. In 1952, Gaggia presented their first domestic use coffee machine, the “Gilda”, named after Rita Hayworth’s portrayal of Gilda in 1946. In 1957, espresso moved to America with an influx of Italian immigrants and a whole new country fell in love with Gaggia’s machines. The “Classic” debuted in 1991 and has been Gaggia’s best-seller ever since. As times have changed, so has the espresso machine. Fortunately, the quality of the machines put out by Gaggia has improved with time. Nuova Simonelli has a rich history that begins in a small workshop in Italy. While others were still learning about espresso and perfecting their art, in 1936 Orlando Simonelli had engineered the first ever espresso machine. This machine was an innovative design and was ahead of its time. In 1946, Orlando Simonelli moved his company to Tolentino, Italy and ramped up production. The company was dubbed simply “Simonelli” and Orlando’s goal was to sell his machines to all of central Italy. In 1950 Simonelli produced the “Selene” which was unique because it allowed for continuous delivery. This was the first espresso machine to use a pump system, which is still the most popular system in use today. In the late 1960’s the company was bought out and renamed to be “Nuova Simonelli”. From there on, quality and innovation continued to come out of the factory. They added electronics to their espresso machines in 1975 and brought out their first super automatic espresso machine in 1984. This was named the “Logica”, and it was an extremely simple to use machine. With one button touch, the user could do everything necessary to make a shot of espresso. It might surprise you to know that there is such a thing as the World Barista Championship – but there is. Nuova Simonelli’s “Aurelia” espresso machine was selected at the official machine to be used in the 2008, 2009 and 2010 competitions. This machine is a favorite among baristas. The machines from Nuova Simonelli continue to be of top quality today, and new innovative designs are produced all the time. This is our top pick for an Italian espresso machine. The Dedica from DeLonghi will give you the ability to pull a great shot of espresso and won’t require a lot of space to do it. The machine’s small six inch footprint leaves you with plenty of room on your counter for you other kitchen appliance needs. Featuring a self-priming system, this DeLonghi machine cuts down on your wait time meaning you won’t have to wait a long time for your machine to be ready to go. This little powerhouse boots up in 40 seconds and only takes about two minutes to make your espresso. Not only will you no longer have to wait in line at your local coffee shop, your homemade shot of espresso can be in your hand in less than five minutes. The Dedica espresso machine can utilize both espresso grounds and espresso pods depending on your needs. You can also brew multiple shots for those times when you’ve had a long night and need more than one to wake you up. You can also easily disassemble parts so that you can clean all of the filters and water tanks. This reduces the time it takes for upkeep and allows you to enjoy your espresso machine for a longer time. Another feature of this machine is the frothing system. The flow stop is automatic, and you can completely customize the froth. 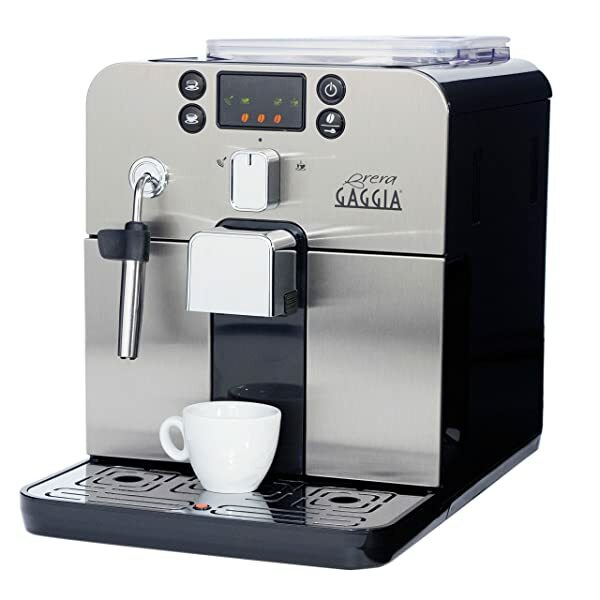 Another space saving option on our list is the Gaggia Brera Espresso Machine. This one is no simple machine though, it’s a super automatic option. You won’t have to worry about dragging the beans out each day to grind them as there is a bean hopper as well as a ceramic burr grinder built right into the machine. A desirable feature of this espresso machine is the brew system that begins with a pre-infusion process. Once your beans have been finely ground, they are tamped and then pre-soaked before the Gaggia Brera begins the brewing process. This may add a bit of time, but the resulting shot of espresso makes it worth it as the pre-infusion process ensures the most flavor and aroma are pulled from the coffee and into your cup. The built in water tank is easily accessible, but you should know that many of the components of this machine are made from plastic. This isn’t a deal-breaker, but it does mean you will need to take special care when cleaning and maintaining your espresso machine. The steamed milk is quickly heated, and the frothing wand is handy and allows you to customize your drink to your liking. 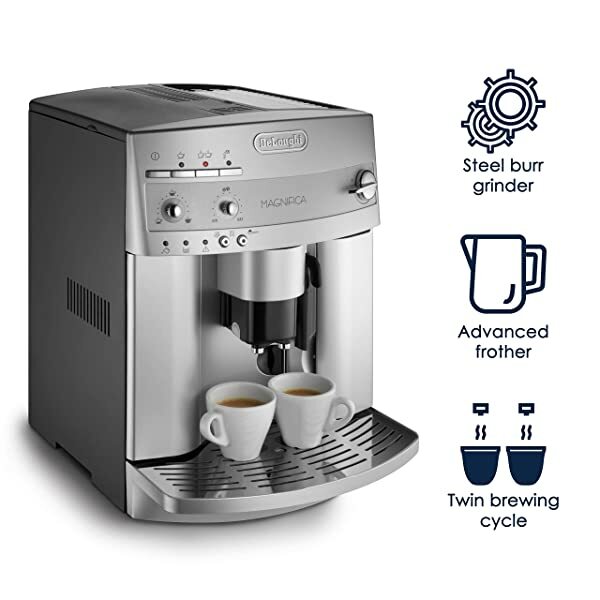 A multitasking machine, the Magnifica from DeLonghi can pull shots of espresso as well as make drip coffee. Other features make this espresso machine a top-of-the-list choice for people who love espresso and want to pull their own shots at home. You’ll be surprised that this compact machine comes with many of the features of a full sized espresso machine. It will fit easily on your counter top and will still prove an excellent shot of espresso. The built in bean hopper stores a half pound of fresh coffee beans. The internal burr grinder allows the stored coffee beans to be freshly ground and processed through DeLonghi’s “Direct to Brew” system. The perfect temperature ensures that every shot of espresso and cup of coffee is consistently made. You can customize the strength, density and richness of each drink as well and the espresso machine allows you to program in your preferences so that you get the same cup each day. Once your shot is pulled you won’t have to wait for the machine to reheat to brew another either, thanks to the Rapid Cappuccino System that maintains the temperature. The brew unit is removable, making this machine easy to clean as well. 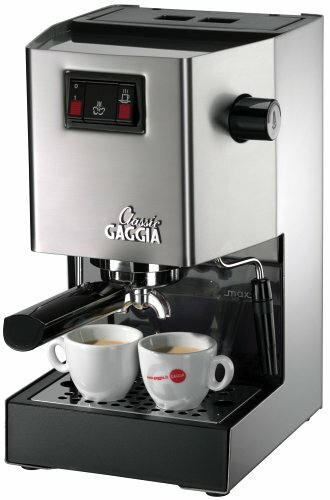 Another popular choice from Gaggia is their Classic model espresso maker. This one is a worldwide bestseller, and once you use it you will be able to understand why. With this machine you will easily be able to make café style drinks in the comfort of your own kitchen. Gaggia is bringing commercial grade features into your home with the 3-way solenoid valve that ensures drip-free operation. You won’t be dealing with leaking water or a wet mess of coffee grounds to clean up. With stylish stainless steel housing, this machine looks like it belongs on the bar of your favorite coffee shop. It is also sturdy and durable, so you can be sure it will last for a long time. The water reservoir holds up to 72 ounces of water, which is enough for plenty of espresso shots to be made before refilling. The specially designed steam wand siphons air directly into the milk to create rich, delicious froth for your drinks. You can also use this machine to dispense hot water for other drinks like tea, which makes it a versatile option. If you’re just breaking into the world of making espresso at home, then the DeLonghi EC702 is a great machine for you. This is a machine that doesn’t have much in the way of bells and whistles, but don’t let that deter you. It will get the job done and it will do it well. There are no extra features or settings. This espresso machine will do exactly what it is intended to do – make espresso. As with many of DeLonghi’s offerings, this machine is self-priming, meaning you won’t have to wait a long time for it to be ready to pull a shot of espresso. 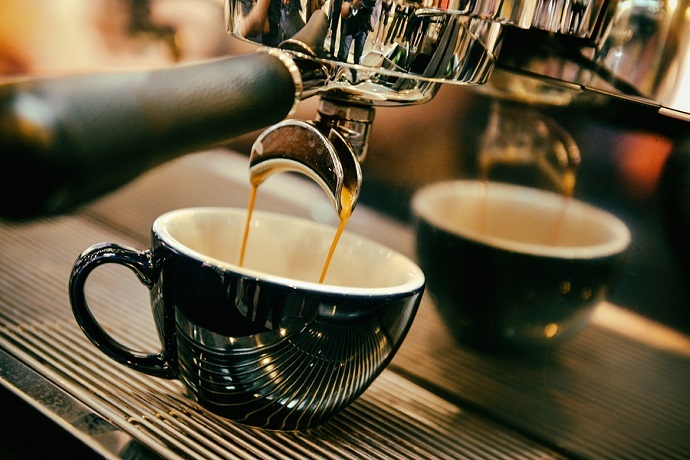 Though it is an entry-level espresso maker, you can count on it being durable as many of the parts of the machine are made from stainless steel. Nonetheless, the machine is lightweight and won’t take up much room on your countertop. You won’t need to worry about the espresso shots not being hot enough as this machine heats well and will retain heat to make your drink. The steam wand allows for a bit of customization on your froth but won’t take any skill to properly use. Italian espresso machines have a long, rich history and they are notorious for pulling dark, frothy, delicious shots of espresso. Purchasing an espresso machine, especially one that is of quality can hurt the pocketbook a bit, but for many espresso aficionados this is worth it in the long run. You can certainly buy a started machine that will produce basic shots of espresso, like the DeLonghi EC702 we looked at, but someday you might want to move up in the world of espresso machines and there are plenty to choose from. As long as you choose a quality manufacturer, you are going to get a great shot of espresso that has tons of flavor and aroma. Eventually you can branch out to the espresso machines that have way more features and settings, offerings that allow for extreme customization. 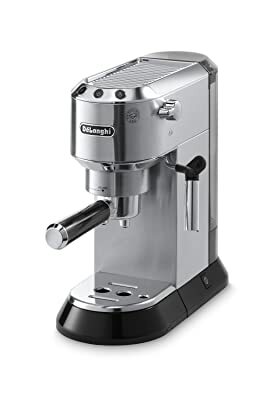 You can have a fantastic shot of espresso in your own kitchen in almost no time when you purchase one of the espresso machines we have listed. Whatever you brew at home is likely to taste better than it would at your corner coffee shop, and it will take you less time to get it made and will not cost you as much either. All of these are great benefits to buying your own espresso machine. The best Italian espresso machine is out there, all you have to do it go get it and get to pulling shots!